This one took forever for me to read. I kept getting distracted and losing interest. It's more like a bathroom reader; you can just pick it up and leave it as you please. It would make a good coffee table book – it'd probably be a good conversation starter. Reading this was like browsing through a stack of biographical works on a bunch of well-known artists. The author’s selected bibliography looks like just that, a collection of sweeping biographies of various famous artists that she skimmed through and pulled the juiciest, most interesting facts that would appeal to the widest audience. You definitely shouldn't use this book as a source if you’re writing a paper on an artist or anything. It’s more of a tongue-in-cheek humorous exposé, not a scholarly source. It’s like Ok or People magazine’s version of an art book. If you’ve taken a lot of art history classes, most of the facts aren’t anything new, but I had forgotten about a few things that I’d learned in college (like that I share my birthday with Edgar Degas, ooh la la!) so this was a nice little reminder. I agree with some other reviewers that the little caricatures (although cute) got in the way more than they added to the book. The captions for the illustrations are summarized on one page and then there’s a full description of the scene depicted on the next page, so that repetition was a little annoying. I think Lunday would have been better off providing illustrations of the standout works that she focuses on instead since not all of them are well-known to people without backgrounds in art. Vermeer’s Girl with a Pearl Earring is easy enough to recall since there’s been a book and movie based on it, but unless you’ve had an art history survey class of some kind, you probably won’t remember what exactly Rembrandt’s The Night Watch looks like unless you google it. 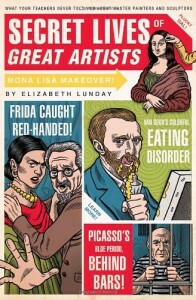 Overall a fun read and a good introduction to art history.